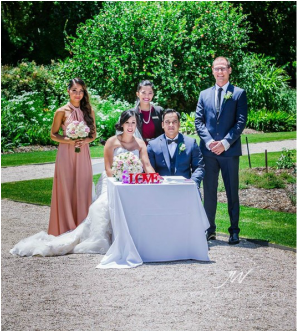 "Gerrelyn was amazing from the start, she made everything simple and nothing was too hard. She was flexible in what was important to us and allowed some last minute changes to our ceremony plan. ​We couldn’t have asked for a better service. Thank you"
​"Gerrelyn, helped us create the most unique, romantic, magical ceremony that truly and purely reflected Paul and my love and feelings for one another. We didn't have a dry eye during the ceremony and the love Paul and I feel for each other totally transpired to all our guest which intern set a day full of magic, love and laughter.Gerrelyn from the very beginning captured Paul and I with her wonderful, vibrant personality. Paul and I living in the UK didn't at all hinder any of the arrangements as Gerrelyn was so happy to work around us. 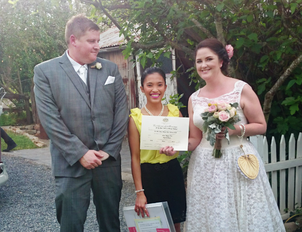 We had so many comments after the about Gerrelyn and how wonderful the whole ceremony was conducted. Thank you Gerrelyn, for a very special ceremony which we will hold in our hearts forever. PS sorry that your book got wet at the signing!! We wish you all the best and success and we hope you have a magical wedding!!" ​"So caring and helpful with what we wanted . Made us feel so comfortable and relaxed on our perfect day." ​"Thank you it was a amazing day couldn't be happier." ​"You where fantastic and we had an amazing night. " ​"Hi Hun. Thanks for today. It was amazing for us!" ​"Had the most fabulous day , everything was perfection , thank you so much for making our day run so smooth, considering all the paper work that was involved, you took all the stress from us. xxxx"
​"We can’t thank you enough for the beautiful Ceremony that you performed for Duane and Zhaoli. Not only do we continue to talk about it, but our guests were also particularly touched by it. The words were very moving and suited the couple perfectly. Everyone thought it was the most beautiful, intimate and loving ceremony they have attended. We would not hesitate in recommending your services to anyone. Thank you so much." ​"Thanks so much again!!! 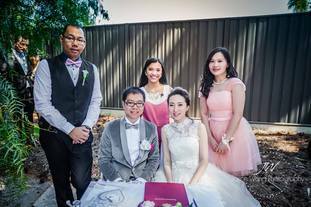 It was literally the best day of my life :D"
​"Hi Gerrelyn, it was a good choice having you as our celebrant. 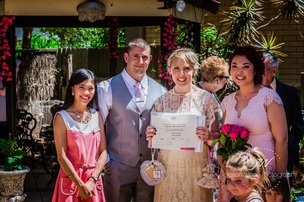 "Thank you for being our fantastic celebrant on Sunday! Would recommend Gerrelyn to anyone..
She's lovely and goes above and beyond in planning your special day ☺"
​"Thank you for being our celebrant Gerrelyn! From the first moment we met her, she had been very organized and professional. Our wedding ceremony went smoothly and beautiful. ​Thank you for everything you have done for us and make our day extra special and amazing. 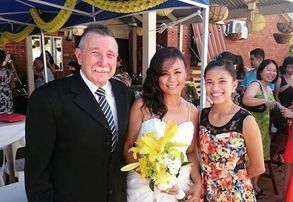 :)"
​"Gerrelyn did a great job as our celebrant. Very casual and easy to approach. She made our ceremony easy to follow and greatly personalized. ​Thanks for an amazing day!" 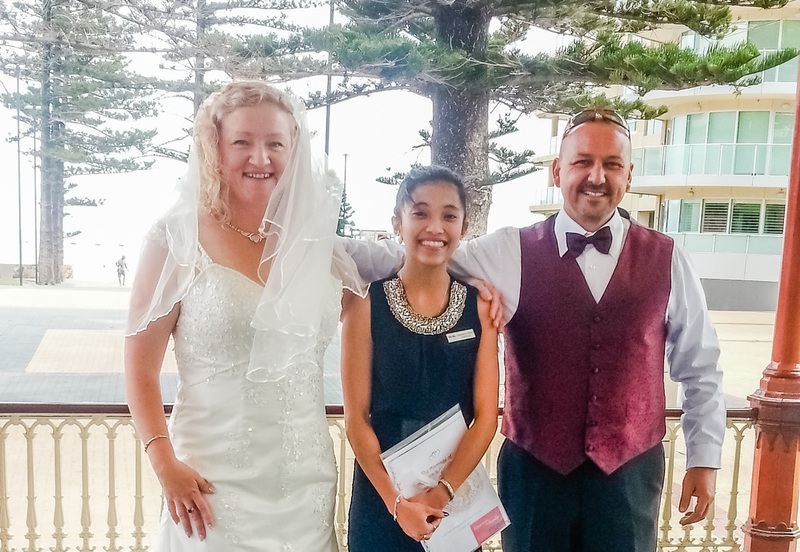 ​Gerrelyn is such a lovely person, from the moment we met her we knew we had picked the right person to be our celebrant. She is very organized, professional and prompt with replies. 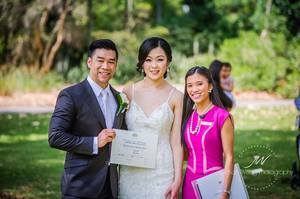 She provided alot of advice to us to help ensure our wedding ceremony went smoothly. Thank you for everything you have done for us Gerrelyn! You definitely made our day extra special! I highly recommend Ceremonies by Gerrelyn!" 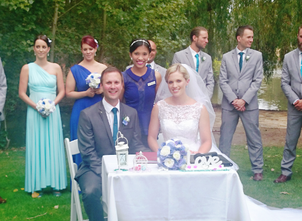 ​"We just want to thank you so much for making our day so perfect. You were perfect!We really appreciate all the extra personal touches." 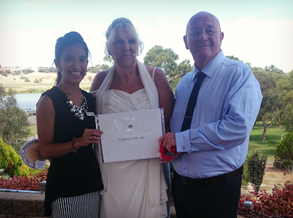 ​"Thank you for your excellent celebrant services Gerrelyn. For being so patient with us taking forever to reply with answers and somehow making our day run so smoothly and stress free. Thank you so much for being apart of our wedding. You made the day run smooth and ensured that we didn't stress. 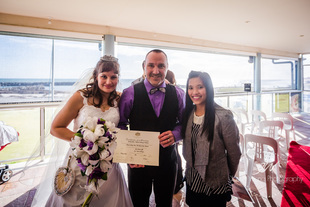 The ceremony was beautiful.."
​A lovely person and very professional. Helped us every step of the way, made our ceremony exactly how we wanted it." 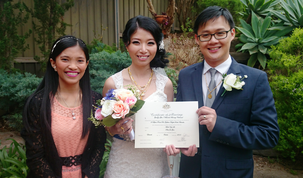 "Gerrelyn conducted our civil marriage ceremony last week. She was very organized and replied all our questions/emails/messages very promptly leading up to the wedding - allowing me to trust that she will manage the ceremony well (one less worry for the bride *thumbs up*). Her service was highly professional yet personal, and the rehearsal was very helpful and reassuring. ​"Thank you for making our day so special and calming our nerves lol. ​You did an amazing job and set the scene for a perfect night. We will be forever grateful and treasure that day forever." ​"Thank you so much, it really was beautiful in every way. ​It was a small ceremony but full of so much love I really am the luckiest person in this world and I couldn't be more grateful ." 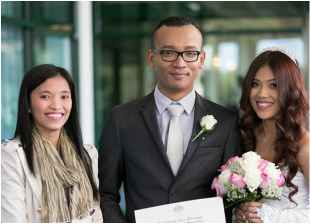 "From the moment we spoke to Gerrelyn we knew that she would be the right person for our special day. Gerrelyn has amazing ideas and is so willing to listen and work with any ideas we had. Although having her own ideas, is always happy to work with your ideas rather then her own. Working together we were able to create a very special day that was exactly what we wanted. Gerrelyn made sure she had everything that was needed for our day which made it so much easier as there was so much we didn't need to think about. Gerrelyn is amazing and I'm sure would make your day as special as she made ours." "I've chosen the best celebrate in Adelaide ! You have done my wedding the most memorable day ever. 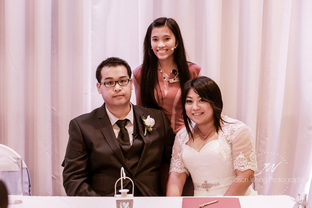 Thank you for being a part of our special day and giving us many advices throughout a short period of time that we had for the wedding, it means a lot to us :)"
​"Thank you Gerrelyn. She gave our day was perfect!!" 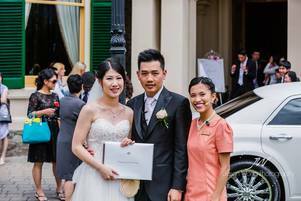 ​"Thanks for helping us celebrating our special day last week and the trip after wedding was also great. Definitely had some quality time with family & friends. Loved every single bit of it and once again, thank you!." ​"You are amazing and very helpful. We loved having you marry us." ﻿"Thank you heaps, our Elizabeth Catholic Parish Choir (ECPC) family for your labour of love. What a pleasant surprise! Thanks for sharing your precious time, skills, talents and resources in putting together this wonderful present for our 25th anniversary. 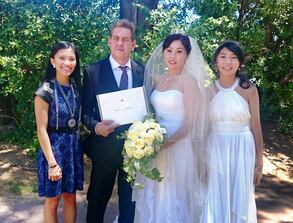 Susan and I wiĺl certainly cherish this special moment with you guys for the rest of our lives. Thank you Gerrelyn Glico & Jason Wong Photography for your awesome collaboration. Great ceremony....great photos. 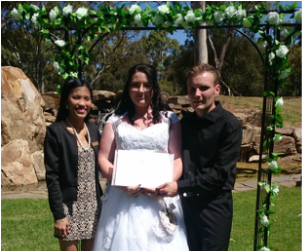 "Gerrelyn performed our ceremony in March. She was very well prepared and gave us an ample of time opportunity to make it our day through additional ceremony requirements. We also like that the rehearsal is included in the cost and that Gerrelyn was happy to come to us instead of travelling her (as we were without a car). Fantastic service and very friendly." “From the first meeting you can tell that Gerrelyn really loves her job and will do anything she can to make your day perfect. I am overwhelmed by the level of care and attention she had put into our ceremony service. She really gets to know you as a couple and tailors the service to suit your personality. ​"Gerrelyn, thank you for being part of our day! You helped us ensure our ceremony was special and reflected and celebrated our little family. We cherish this and you in our hearts. Xxxx"
​"Thank you so much ms. Gerrelyn for making our wedding simple BUT yet very memorable, happy, and lovable moment's in our life. Again from the bottom of our heart's so many thank you and god bless............"
"Gerrelyn performed our ceremony in February and could not have been happier. She was so organised leading up to everything always just an email or phone call away. She was constantly in communication with us letting us know what we needed to have done when etc. She made the whole process so easy for us. "Absolutely fantastic! Our day was perfect... Couldn't have asked for anything better!" ​"This wonderful lady made our day perfect, she's on the ball with all documents, legalities, time allocations, friendly & approachable- can not recommend her enough- thank you from the bottom of our hearts Gerrelyn. Mr & mrs Hall ♥"
"Hi Gerrelyn! David and I would like to give a HUGE thank you for being our celebrant on our special day. Especially for all you patience, help and great advices prior to the big day! We felt calmer knowing we had a professional at hand, who gave us all the necessary guidance and excellent service. We loved the rehearsal, for first timers like us it made the whole process comfortable and easier to understand. We appreciate everything you've done and again a big thank you for being our celebrant! " 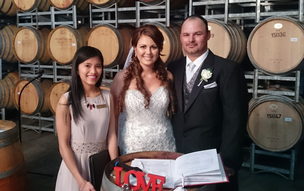 ​"Hello Gerrelyn thank you for doing such a great hod today as our celebrant, Mark and Mylie Mulholland. We both enjoyed the service and the work you put in to it and we hope to keep in touch." "Thankyou so much for your prompt organisation & involvement in our Marriage Ceremony. We were both very impressed with the way you prepared our written service & now have this with our own vows typed up & beautifully presented as an ongoing reminder of our special day. It was great to be able to stay in touch with you leading up to the ceremony as you were very prompt with your communication. Your exuberant personality, warmth & kind words made all the difference on the day & helped elevate our nerves! We would definitely recommend your services again to anyone we know in the future. 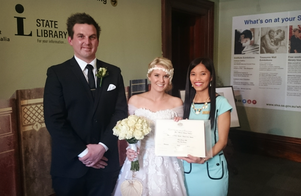 Good luck with your ongoing career as a Celebrant & thanks again for supporting us on our day!." 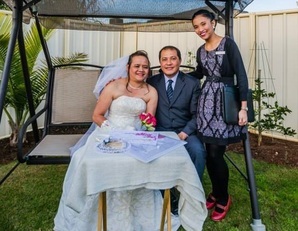 "Thankyou so much Gerrelyn for helping make our special day so memorable. Your professionalism from the first phone call through to an including the ceremony was outstanding. Your help with the order of ceremony and rehearsal meant so much to us. It is only fair to say that your efforts were faultless. Iris and I can not adequately thank you enough for your assistance over the last four weeks. All the best in the future and to those out there considering using a celebrant for their special day. You will not be disappointed in choosing Gerrelyn." "What can I say besides, thank you so much Gerrelyn for making Alice and my wedding day so fantastic. 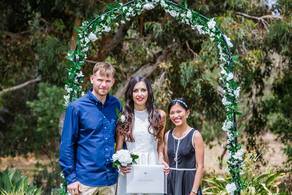 We couldn't have made a better choice in choosing such a fantastic celebrant as yourself. You were such a great help in helping us organise everything for our special day. Even more so because Alice was in London and myself being being 600kms out of Adelaide, at the time when we were putting the wedding together. From day one you were professional, prompt with all communications, documents and advice. It was such a brilliant day. Also a huge thanks to Jason for his help and advice as well. With saying all this, any couples out there who want a great wedding preformed by a wonderful, friendly, professional and just a really nice person who will not let you down, I would defiantly recommened Gerrelyn to everyone. Once again thanks heaps Gerrie, from Alice and Dave."